Hello! 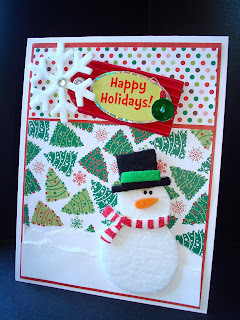 As most of you already know, I play the Christmas Card Challenge on Splitcoaststampers where we make Christmas Cards all year long so that were not stressed out trying to make them all during the busy Holiday Season. 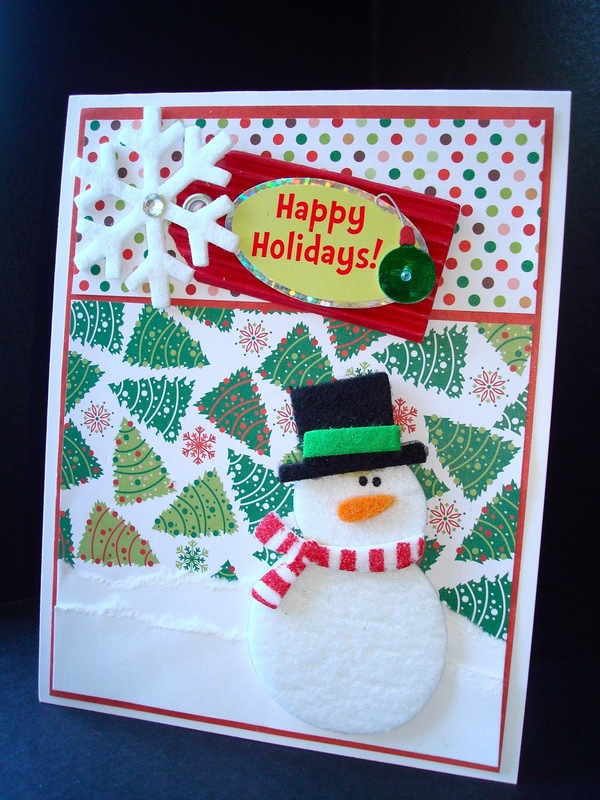 I make four Christmas Cards a month so that I'll have about fifty at the end of the year. This month I was super busy (with our vacation to Missouri and my daughter and son-in-law visiting for a week at home), so it was hard to get them done. 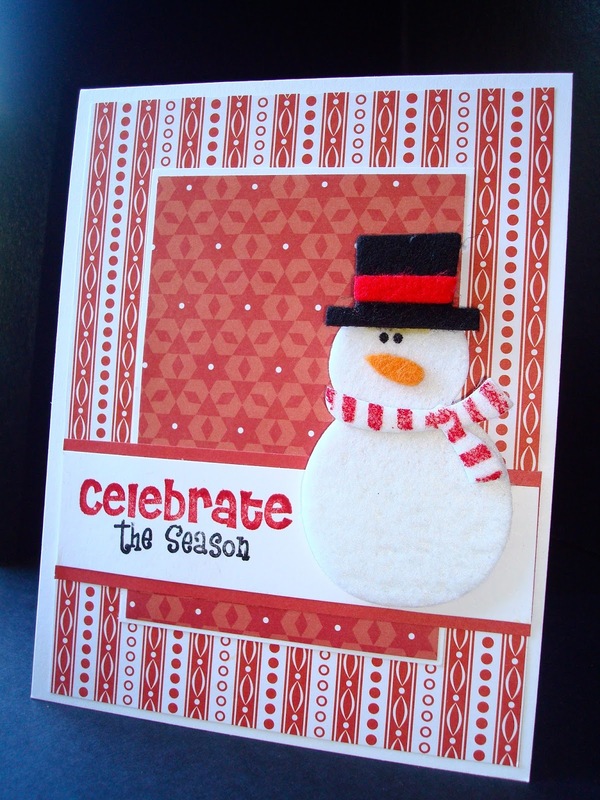 I decided to keep it simple, and just use some pre-purchased felt images from JoAnn's Fabrics and Crafts. 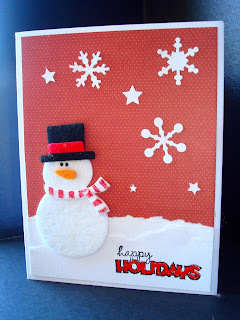 I got all the layouts from Pinterest Christmas Card Board. For my first card I cased this layout. All the paper on all four cards is from the same DCWV Holiday Matstack. This layout is from HGTV. I'm not sure I like this card, but it will have to do. I have no time to make another one. HERE is the original card. And finally, my fourth card. 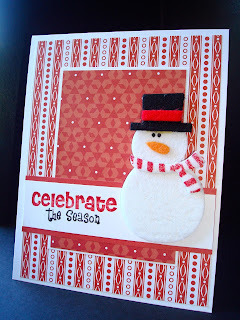 I added the snowflakes using a Cuttlebug Die. I created my own layout this time. Hello. 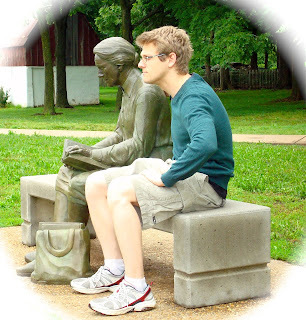 I'm continuing to blog about our first day of vacation in Springfield, Missouri; my last post described our trip to the Springfield Botanical Gardens. 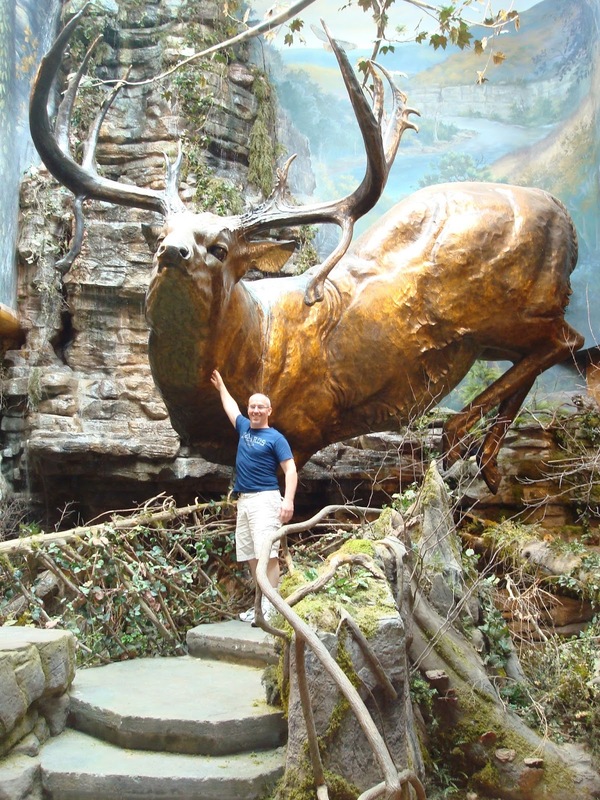 "Grandaddy of all outdoor stores. Fishing, hunting, camping, boating, golf, gifts, footwear and apparel. 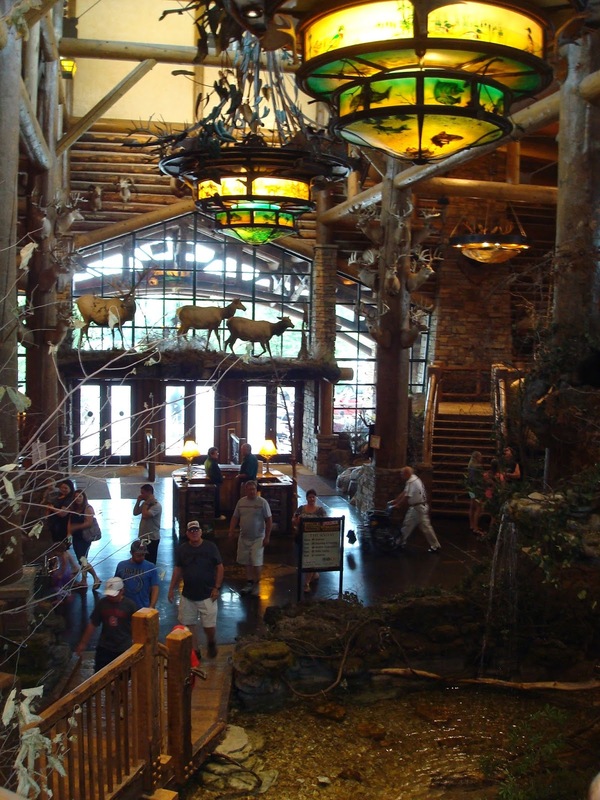 Explore the 300,000-square-foot showroom loaded with unique features, including an art gallery, barber shop, firing range, Tracker boat showroom, waterfalls, aquariums, Hemingway's Restaurant, a coffee shop and much more. Your adventure starts here." Well of course we had to stop and see this, and what an adventure it was. They had lots of aquariums filled with fish, and some small alligators as well. It was a taxidermists dream....every dead, stuffed animal you could imagine was there. My daughter has a phobia for taxidermy so she waited in the car...and it was a good thing. I don't usually like taxidermy either, but the way the company had it set up, it was more like a museum. They placed all the animals in their natural surroundings and had great quotes every where about nature, conservation, etc. Below is a picture of me about to enter the store. This is what you see when you enter the doors. 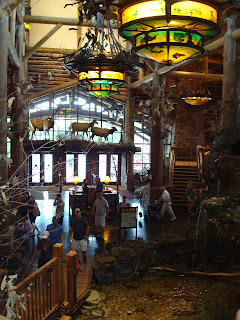 The chandeliers are gorgeous, and the first thing you notice is the giant elk/deer in the background and all the mounted and free standing deer everywhere. The detail in this place is amazing. Everywhere you look is something very intricate and detailed. The banisters on the railing to the steps are hand carved cougar heads, there is a massive fireplace to your right when you just walk in that's got a beautiful iron screen on it. 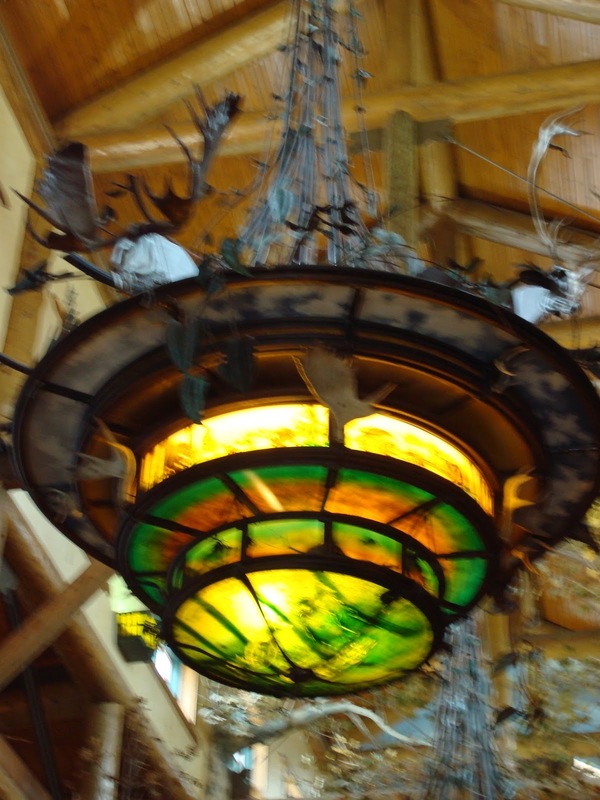 The ceilings are either rustic beams like pictured below, or painted to look like a sky with flying geese hanging from strings above your heads. In the fishing department they paint the ceiling to make it appear as if your under the water looking up, you see fish and swirling water above you. There are stuffed squirrels and other small animals on top of every merchandise shelf. There is so much to look at, it's almost overwhelming. Here is a closeup of one of the chandeliers. There are real deer heads on top of the chandelier to give you an idea of the scale. Even if your not into nature or woodsy things, anyone can appreciate all the beautiful 'artwork' in this place. This is a view from the top of the staircase as if you were looking out at the entrance to the parking lot. Here is my husband in front of the large elk statue. It really gives you some idea of the size of the statue. 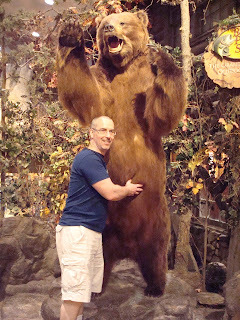 Here is a picture of my husband with one of the many animals in the store. You could spend an entire day in this place, there is so much to do and see. There's a beautiful restaurant, two coffee shops, and actually lots of cute shoes and apparel for women. I thought the prices were reasonable too! But we had Ashley waiting in the car, so we only stayed for a couple of hours. It was great FREE entertainment, and the place was filled with kids. I was shocked to see how the store allowed kids to run all over the place and touch and play with everything. They were climbing in and out of all the speedboats and playing with all the steering wheels and engines. I said to my husband...'I sure wouldn't want to buy that boat after it's been displayed here'. I wonder what they do with them. So if your looking for a great learning experience for the kids, that free and entertaining, I highly recommend stopping here. Hello! I just returned home late last night after a week's vacation in the Springfield/Branson Missouri area visiting my husband's family. I have a week's worth of photos and stories to share, but I will do only one post per event to keep the posts from getting too long. Most of you already know we live in Northwestern Wisconsin, so it was about a 12 hour drive for our family of five before we arrived at our destination. With three adults children crammed in the back of our Chevy Impala, and with my back, arthritic, and bladder issues, we stopped quite a bit to 'stretch' and 'pee'. We drove through three states to get there: Minnesota, Iowa, and Missouri and it was not very scenic at all once we got out of Minnesota; very flat and boring. So we occupied our time with sleep, DVDs, books, and of course, great conversation. By the time we finally arrived in Springfield, we all very ready for a good night's sleep. The next morning was Sunday, and it was Father's Day. We first went to a 'Mega Church' in Ozark, Missouri called "James River Assembly". It was quite the experience. My husband wanted to go there to meet the pastor John Lindell whom he had read about on-line and admired for standing for biblical morals in spite of political pressure. The church has about 9000 members...quite different from our less than 100 member church of our small community. Of course the facilities and worship was amazing, but what we appreciated more than anything was the sound biblical doctrine of the preaching. It is so rare today not only to see someone who has such great public speaking skills, but also uses scripture consistently throughout their sermon to support their message. And, the highlight of our visit was that even though the church has 9000 members, we still got to personally meet John Lindell and shake his hand and thank him for standing firm and not caving in to political correctness. After the service it was time for a Father's Day lunch with my husband's family. They had chosen to all meet at one of those 'all you can eat buffets'. Now, my nuclear family doesn't go out to eat too much, but when we do, we prefer a quiet little restaurant that no one else knows about. Well, you can imagine the 'zoo' an all you can eat buffet was on Father's Day. My son has a lot of 'food issues' and was totally mortified by the 'herd of people' piling heaps of food onto their plates as if it was the last meal they'd ever eat in their life. And, at $15.99 per person, I can hardly blame them; after all, you want your money's worth. But, the noisy, crowded, messy atmosphere was definitely not us. Three or four hours later, as we pried ourselves from the table with our bellies full of prime rib and me experiencing some horrific gas pains, we said our 'goodbyes' and then went grocery shopping for our quiet picnic lunches we hoped to have the rest of the week. And that was the end of Day One. The beginning of Day Two was spent at the Springfield Botanical Gardens. 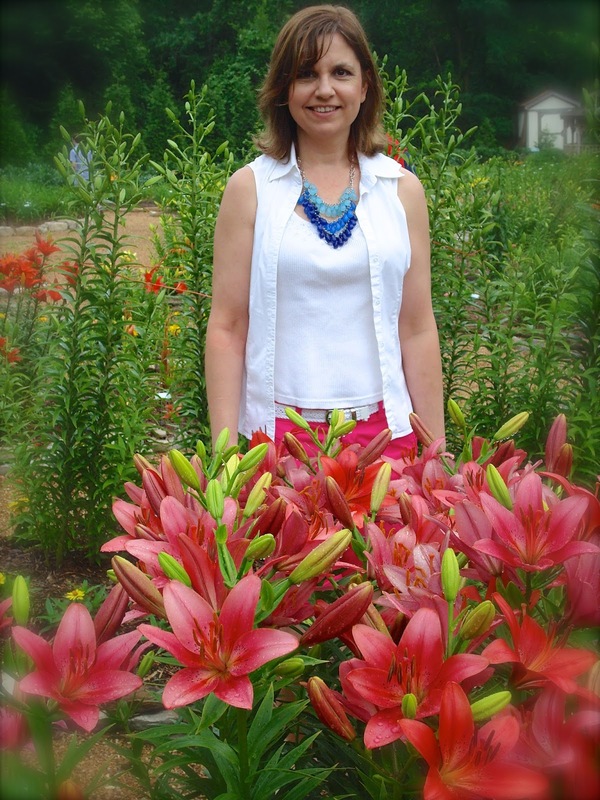 Now most of you already know I'm a flower lover, and I have my own vast flower gardens, so one of my favorite things to do on any vacation is to always tour the local botanical gardens. I've been to a lot of amazing botanical gardens in my life; the Chicago Botanical Gardens, the Minnesota Landscape Arboretum, and my hometown favorites Boerner Botanical Gardens and the Mitchell Park Conservatory, to name a few. The Springfield Botanical Gardens is very small and very new in comparison to the above mentioned gardens, but it was still a lovely place to spend a beautiful morning and best of all, it was FREE. When your traveling with a family of five, FREE admission is always appreciated! 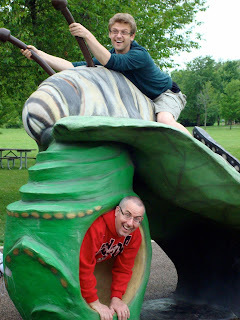 The first picture shows my husband and son in law playing on one of the children's sculptures in the garden. They had a nice playground and a screened in butterfly house for 'kids' of all ages. Here's a picture of one of the flower gardens. 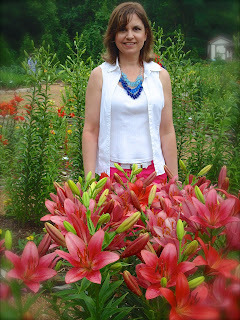 This is me in their lily garden. 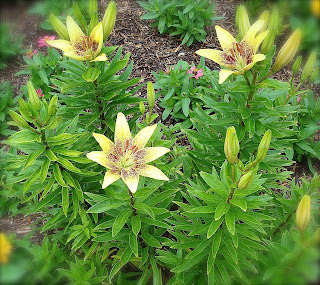 A close up of one of their lilies. I thought this flower was so interesting. I've never seen a green lily before. This is a far away shot of their ornamental grasses garden. I saw a lot of ornamental grasses all over the town of Springfield. I found it very beautiful and wished I could grow it here in Northwestern Wisconsin. We can grow some ornamental grasses, but not too many. It obviously thrives on the hot, dry weather of the south. This is me inside one of the paths of the ornamental grass garden. And that is me standing in front of 'Bamboo'. Another plant we can't grow in Wisconsin. My husband thought it was corn and I said 'I don't know of any corn that grows that tall! ', upon closer inspection, we saw the bamboo stems and realized what it really was. My son-in-law mimicking a statue by the the lake on the property. There was a beautiful lake on the property where there was plenty of friendly ducks and geese to entertain us. 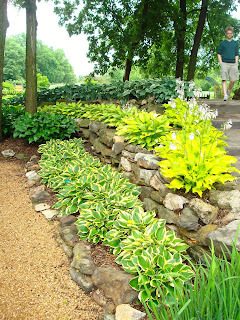 And the final two pictures show the Hosta garden. 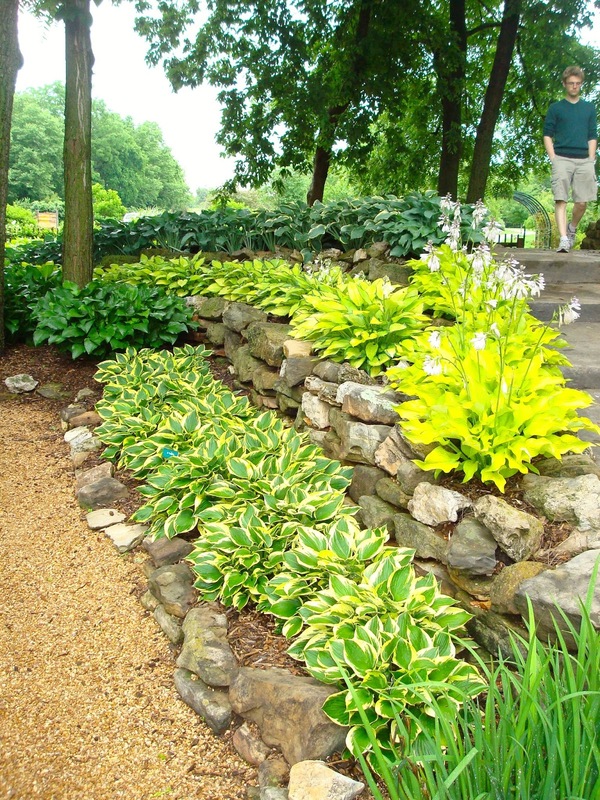 A lovely shaded garden filled with every variety of Hosta you can imagine. It only took a few hours to casually stroll through this small botanical garden, but we enjoyed the peaceful atmosphere, and just being in nature and listening to all the sweet songbirds. It was a wonderful way to spend a summer morning. Hello! I needed another Anniversary Card so I decided to play the CASology Challenge this week. Their challenge cue word is 'Yellow'. I got the sketch for my card from somewhere, but I don't know where. I really like the squares of different shades of yellow. My flowers are pre-purchased felt pieces from JoAnn's Fabrics and Crafts, and I made the stems with quilling paper. A super easy card that came together in minutes yet still looks fabulous. My kind of card! Hello! It has been raining non-stop here in Northwestern Wisconsin, and it's been very cool. I heard our average temperature this month has been twenty degrees below normal and we had over twenty inches of rain. Wow! We've all been a little grumpy because were all wet and cold and want sun and warmer temperatures! My yard however looks like the amazon forest! The perennials are loving all this wet cool weather. The summer annuals which love heat and sun however, are not; so those are slow to get going. The weeds unfortunately are also really taking over my yard (SCARY! ), but there's not much I can do about it with my busy full time work schedule, vacations, and the constant rain. I am very upset about it, but it is what it is. 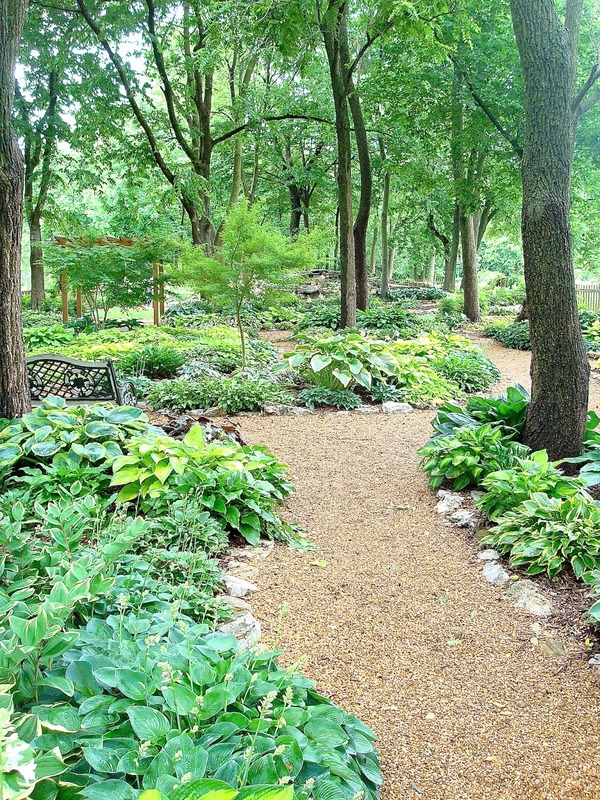 Below is a picture of my Southern garden taken from the top of a hill. That's two Viburnum (Snowball bushes) you see in full bloom, with a garden arch below. I love these Snowball bushes! 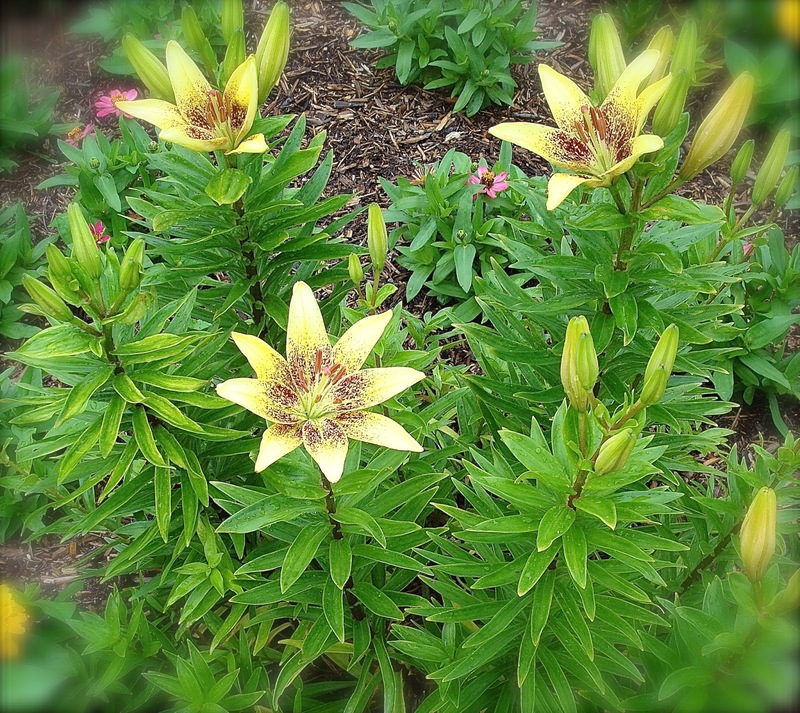 They are so hardy, and so beautiful when in bloom and they really grow well here. The iris are just starting to bloom. These violet ones are always the first bloom. Look at all the lush beautiful green foliage it has for a backdrop! Here is more iris in the foreground and background with a Viburnum in the middle to set it off. 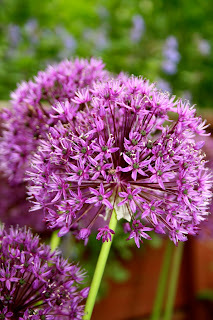 I have several Ornamental Onions in my yard. I really love them because they are so hardy, animals won't eat them, and they are very different and bloom at a time when there isn't much else in bloom. Cat mint grows in abundance in my yard. I absolutely love it and I let it reseed everywhere. The bumblebees love it too. See him in the center of the picture? Have you ever been stung by a bumblebee? I have! Worst sting I ever had! 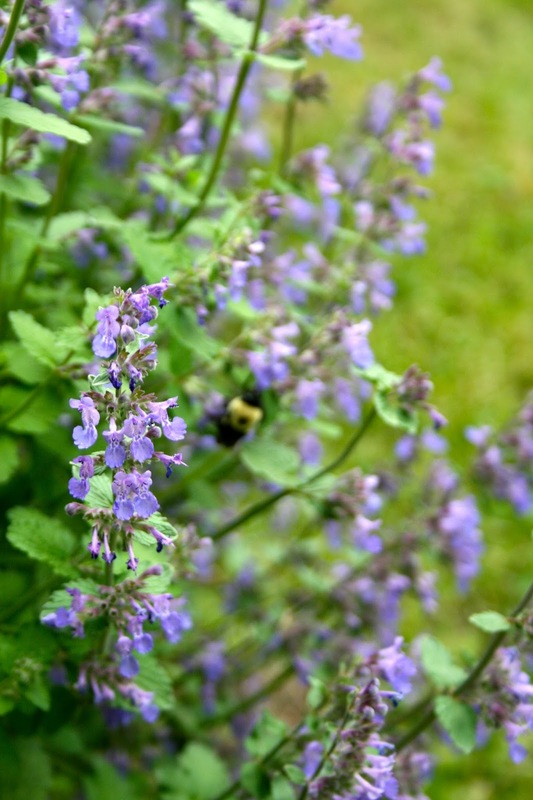 I am highly allergic to any insect bite --- if I get a mosquito bite I swell up, itch and bleed for a week, so when I got stung one year by this little guy I was in pain and agony! I think my arm swelled too twice it's normal size, and I couldn't even function I was in so much pain. I'm not afraid of them though. When they are busy like this, they don't bother you. I was stung that one time because I happened to be out in the garden on one of those cool late summer days and the bee was 'asleep' and somehow crawled on me and stung me. That's when they are dangerous. I've since learned to stay out of the garden during those time periods. Here's a close up of the violet iris. This is one of my favorite iris in my garden. It's a beautiful deep purple and has a wonderful, strong scent. One of my all time favorite ground covers. It's very hardy, yet, not invasive like most ground covers. I brought these yellow iris home from my husband's grandmother's house in Waupaca, Wisconsin. I love how flowers can become a part of your family's history. That red brick house in the background is mine! Here's a close up of the yellow Iris. 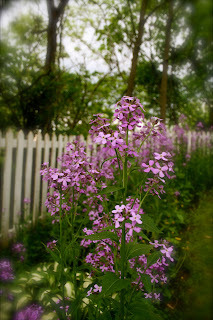 I have seen wild dame's rocket growing along the roads here ever since I moved here, and have tried for years to get them to grow in my yard. They kept wanting to reseed on the OTHER side of my fence, and not in front of my fence. Well, this year, they finally ended up on the right side of the fence. I know they are a wild flower, but my flower gardens are becoming more and more 'naturalized' every year, so I don't care. Some people 'naturalize' their yards on purpose because they are better for the environment and easier to take care of. I think that's what's happening to my yard. It has evolved from a well maintained perennial garden into a beautiful woodland meadow filled with wildlife (and lots of weeds). Here is a close up of the Dames Rocket. A faraway shot of my Iris in bloom. The ferns are just LOVING all the rain and cooler temperatures. I usually have a hard time growing them in my yard because of all the dry hills, but I couldn't believe the size of them this year. They look like they belong in a scene from 'Jurassic Park'! I had to have my handsome son sit in front of them so you could get an idea of the scale of them. They are just so lush, and big! Hello! It was finally a little warmer here in Northwestern Wisconsin today...and the sun came out too! I had to work though so I wasn't able to get out and enjoy it, but I sure did like seeing the sun come in through the windows instead of seeing clouds and rain all the time. I needed another Anniversary Card this week, so I decided to play along with the CASology Challenge Blog. Their challenge is to make a card or project using the cue word 'Wheels'. 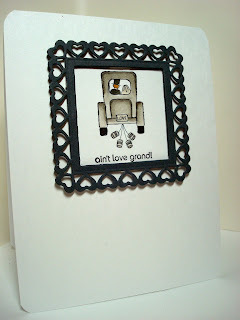 I immediately thought of this retired image from Stampin Up! 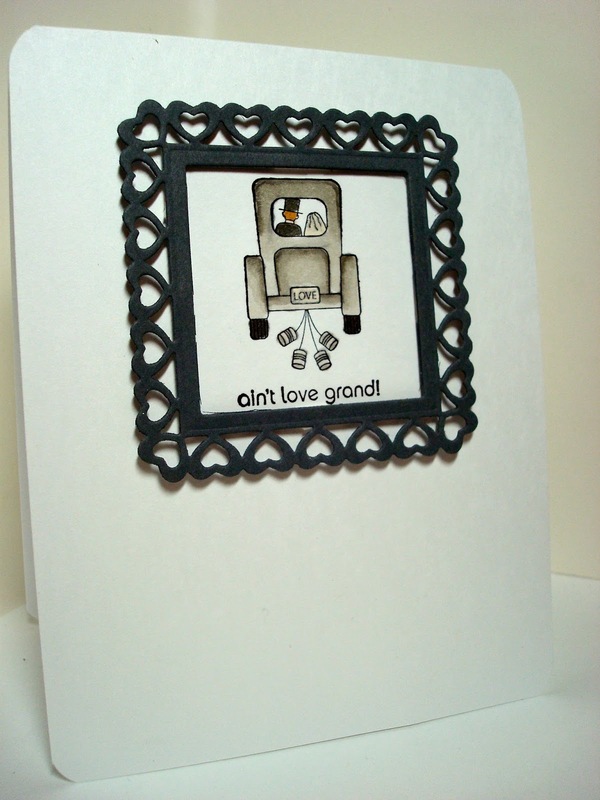 I simply stamped the image, colored it, and then put this heart frame from Spellbinders up on dimensionals around it. 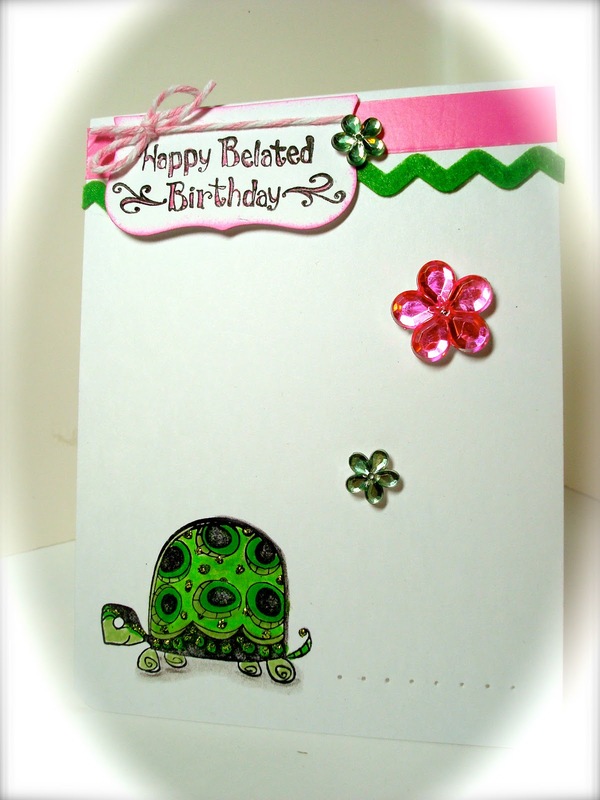 I also rounded all the corners of the card with a corner rounds. Clean and Simple! Hello! It's still cold and rainy here in Northwestern Wisconsin. Our high today was 58 degrees. I'm writing to you with my spring coat still left on from work because it's cold in my house. Oh, the winter that will never end. 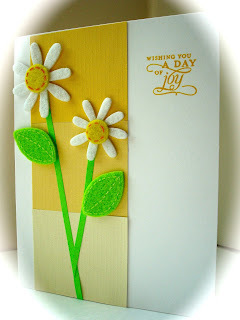 So what better to do than create a spring card for the Crafty Secrets Garden Challenge. If I can't have warm weather in real life, at least I can see it in pictures! I had purchased a lot of these beautiful vintage pictures from Crafty Secrets during Christmas Time as a Christmas gift to myself (along with almost all the stamp sets I ever dreamed of owning before they disappear since Crafty Secrets is now a digital company) but hadn't used any before now. They were just too pretty to cut up. But I really wanted to try one so I chose this beautiful bird and flower image to make an Anniversary card. 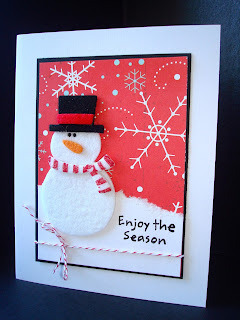 My layout is from Splitcoaststampers (SC382) and the paper is from Prima. I sprayed some shimmer mist on the image before assembling the card. Boy, did that make a difference! It is so sparkly and pretty in real life. This is a also a new Spellbinder's die, but I had a lot of trouble with it. Part of the frame did not cut clean or want to come out of the die. I had to try three times before I was successful and I also had to use a much thinner card stock than I normally do. Has anyone else had trouble with the more intricate dies before or is just me? Maybe I got a defective die, I don't know. I've never had trouble with their other dies, but this is the first one I bought that was so intricate. I've never been one for a lot of embellishments on cards, and with this beautiful image and intricate die I didn't feel much more was needed, so I only added a simple organza bow and yellow ribbon flower. Hello! It has been raining non-stop in Northwestern Wisconsin. It's been such a cold, wet, miserable Spring following a long, cold, snowy winter, so I have not been too happy lately. I can't get out into my garden for anything, and I just watch the weeds take over my yard in abundance because of it. It's so depressing. But, on the positive side, I get to spend a lot more time in my craft room (with an electric heater running on June 4 because I'm so cold!) and participate in challenges I normally do not have time for. I've always admired Flourishes Stamps from afar and treated myself to a lot of them at Christmas Time when they had a total transaction discount; but most of them sat unused in my craft room since. When I saw the Timeless Tuesday Challenge this week, and I had plenty of time due to the rain, I decided to pull out one of the many fruit stamps I had purchased but never used. 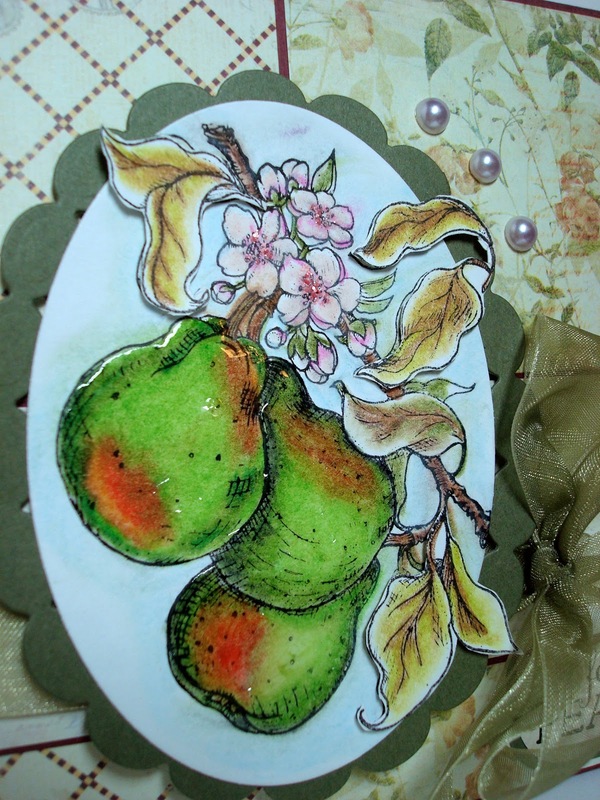 The challenge is this week is to feature a fruit or vegetable on your card. I needed three anniversary cards this week, so I decided to use the pear image because it had a 'couples' sentiment with it. I had never colored fruit before and found it a bit intimidating so looked at some cards in the Flourishes Gallery for inspiration. I started with Copics, but didn't think I had the enough shades of green, so I dusted off my PrismaColored Pencils and Gamosol (Gees, it had been awhile since I used those!) and used those instead. I forgot how to use them since it had been so long, but eventually remembered as I went along. If I had more time, I'd redo this card because I don't think the coloring is the best, but I really don't think the recipient will even notice...so better luck next time! 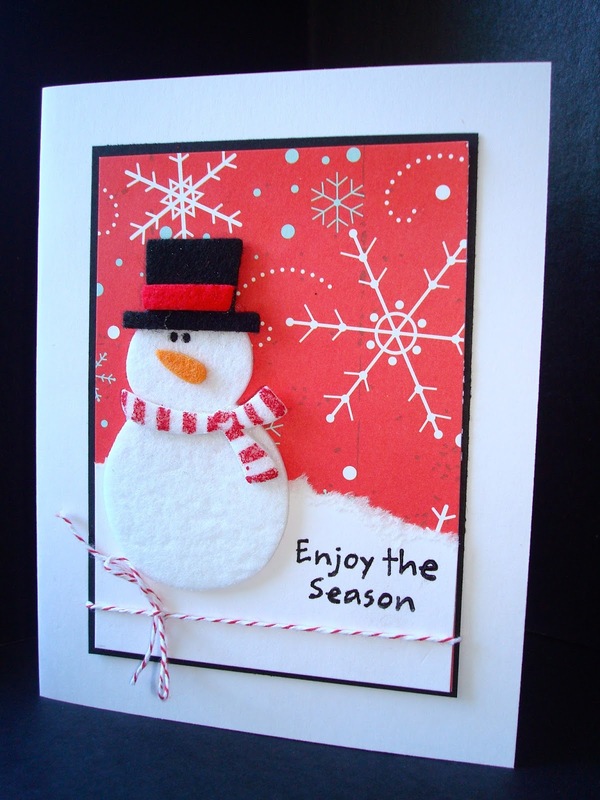 The layout is from Splitcoaststampers (SC402) and the paper is from Prima. I stamped the image twice, and colored, cut out and popped up on dimensionals a few of the leaves that went past the frame. Adhesive pearls and ribbon were added for embellishment. Because I wasn't happy with my coloring, I added some Crystal Effects to the pears and put pink Stickles in the middle of the flowers.